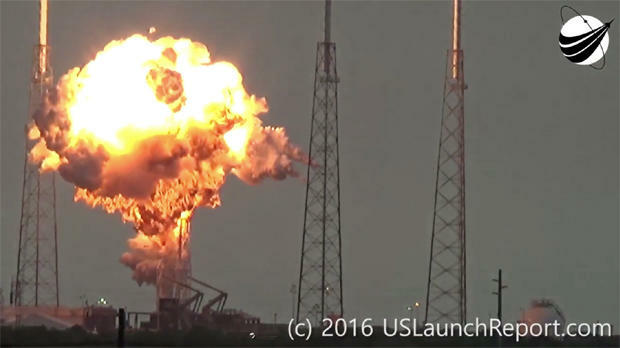 After an exhaustive investigation, SpaceX engineers have identified the most likely cause of the spectacular explosion of a Falcon 9 rocket during a pre-launch test Sept. 1 that destroyed the booster and its $195 million satellite payload, the company announced Monday. SpaceX engineers believe the Cape Canaveral Air Force Station mishap was triggered by the failure of a high-pressure helium tank, one of three used to pressurize the second stage liquid oxygen tank. Putting corrective actions in place, the company said Monday it plans to resume flights with a launch from Vandenberg Air Force Base northwest of Los Angeles on Jan. 8 to boost 10 Iridium NEXT satellite telephone relay stations into orbit. It is not yet known when SpaceX plans to resume flights from Cape Canaveral. Launch complex 41 at the Florida Air Force station was heavily damaged in the Sept. 1 mishap, and the company plans to use a repurposed space shuttle launch pad at the nearby Kennedy Space Center for its next Falcon 9 flight from Florida. Sources indicate the first flight from Kennedy will be another commercial mission. The next SpaceX flight to deliver cargo to the International Space Station, the company’s 10th under contract to NASA, is expected to take place some time after the commercial mission. SpaceX’s Falcon 9 rocket uses super-cooled, or “densified,” liquid oxygen and RP-1 kerosene fuel to provide additional performance during ascent. To achieve and maintain the desired low temperatures, propellant loading begins just 35 minutes before launch. To push propellants to the rocket’s engines, the Falcon 9 uses highly pressurized helium stored in aluminum bottles, wrapped in a tough, insulating carbon composite material. The bottles, known as composite overwrap pressure vessels, or COPVs, are mounted inside the propellant tanks, submerged in frigid liquid oxygen and chilled kerosene. On Sept. 1, about five minutes before a planned test firing of the Falcon’s nine Merlin 1D first stage engines -- a routine pre-launch test for SpaceX -- the second stage suddenly exploded in a spectacular conflagration that was caught on video and widely seen around the world. The rocket and its $195 million payload, a commercial communications satellite, were destroyed, causing heavy damage to launch complex 41 at the Cape Canaveral Air Force Station. Just 93 milliseconds elapsed from the first signs of trouble to the explosion. “Investigators scoured more than 3,000 channels of video and telemetry data covering a very brief timeline of events,” SpaceX said in a statement posted to its website. “Because the failure occurred on the ground, investigators were also able to review umbilical data, ground-based video, and physical debris. “Specifically, the investigation team concluded the failure was likely due to the accumulation of oxygen between the COPV liner and overwrap in a void or a buckle in the liner,” the company said. Liquid oxygen has a temperature of around minus 298 degrees Fahrenheit, but SpaceX chills the propellant to around minus 340 degrees for use aboard the Falcon 9. The RP-1 kerosene fuel, which normally is stored at a room temperature 70 degrees, also is chilled. The lower temperatures increase the propellants’ density. A rocket engine’s thrust is directly proportional to the rate propellants are consumed and expelled. By “densifying” the Falcon 9 propellants, more fuel can be stored and pumped through the engines, increasing performance. While earlier rockets, including the Titan 2 booster used to launch NASA’s Gemini spacecraft in the 1960s, used propellant cooling to increase density, and thus engine performance, the upgraded Falcon 9 is believed to be the first utilizing super-cooled cryogenic oxygen. Failure investigators “identified several credible causes for the COPV failure, all of which involve accumulation of super chilled LOX or SOX (solidified oxygen) in buckles under the overwrap,” the company said in its statement. The Sept. 1 failure was the second involving the Falcon 9’s second-stage helium pressurization system. During a June 2015 launch to deliver supplies to the space station, a strut holding a second-stage helium tank in place inside the liquid oxygen tank failed, allowing the helium bottle to shoot up and crash into the top of the oxygen tank, triggering a catastrophic rupture. It was SpaceX’s first outright Falcon 9 failure in 19 launchings dating back to the rocket’s maiden flight in June 2010. After taking steps to ensure all internal struts met design specifications, SpaceX launched nine successful missions in a row before the Sept. 1 launch pad disaster, all of them using densified propellants.